For the past 20 years, Pokémon trainers have only been able to carry up to six Pokémon around with them at any given time. Excess Pokémon were left to make a home in the PC, where they're stored in boxes of varying designs. Over the years, these have become less clinical, thanks to new wallpapers and increased space. But Pokémon Sun and Moon promises to radicalize the storage system entirely, giving Pokémon a far more welcoming home-away-from-home. Poké Pelago is a set of islands that exists within a player's personal computer, offering stored Pokémon several activities to participate in when they're not included on the main journey. 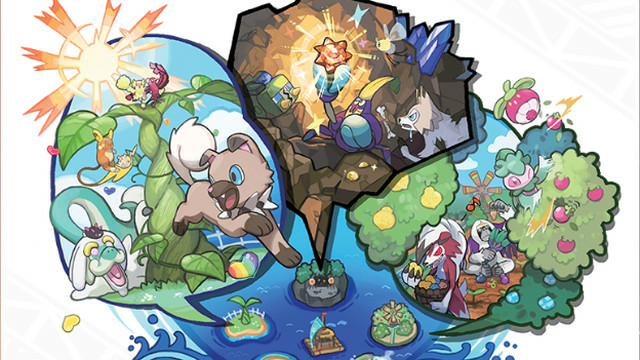 These islands — much like the four that make up the Alola region — form their own kind of minigame as players are given tools to mold them to their liking. They increase with number over the course of the game, and Pokémon can scout out items and experience during their visit. Certain islands even attract wild Pokémon, which a player can coax into joining their team. Other items hide rare items, like evolutionary stones, making the box system an especially vital part of the game — even more than usual. Pokémon Sun and Moon are packed with side quests, to the point where we seem to know less about the main journey than we do about the other adventures awaiting us. Here's hoping the story is just as innovative when the games launch on Nov. 18.